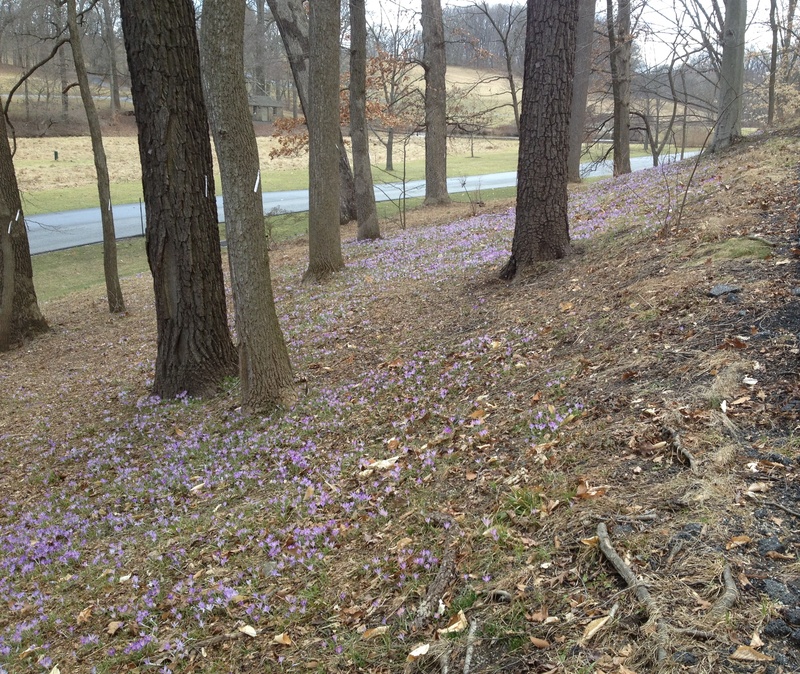 Driving by the old pit houses on Chandler Farm Road—just below the Greenhouses, was a sweep of purple “tommies”. How many times do vehicles pass by and perhaps not even notice? Bet you the hungry winter bees know their location! 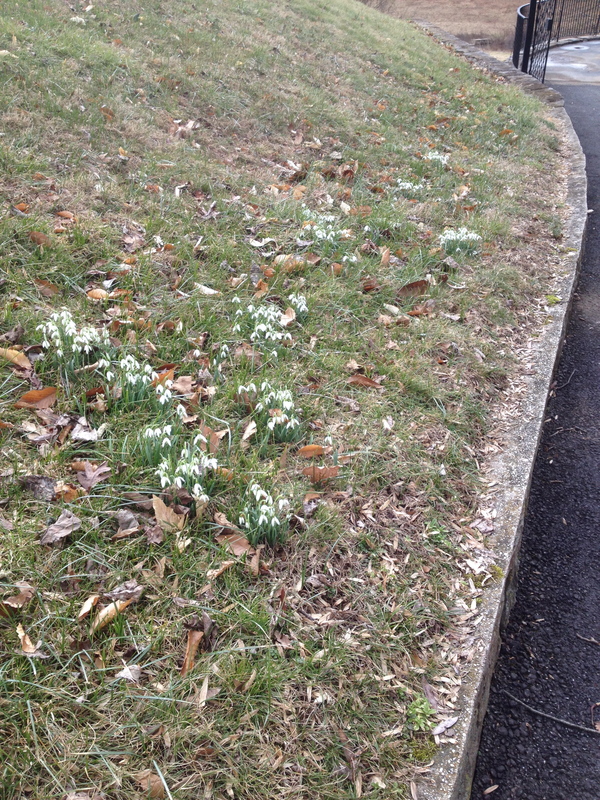 Coming to the turn onto Garden Lane there is a small patch of snowdrops off to the right. 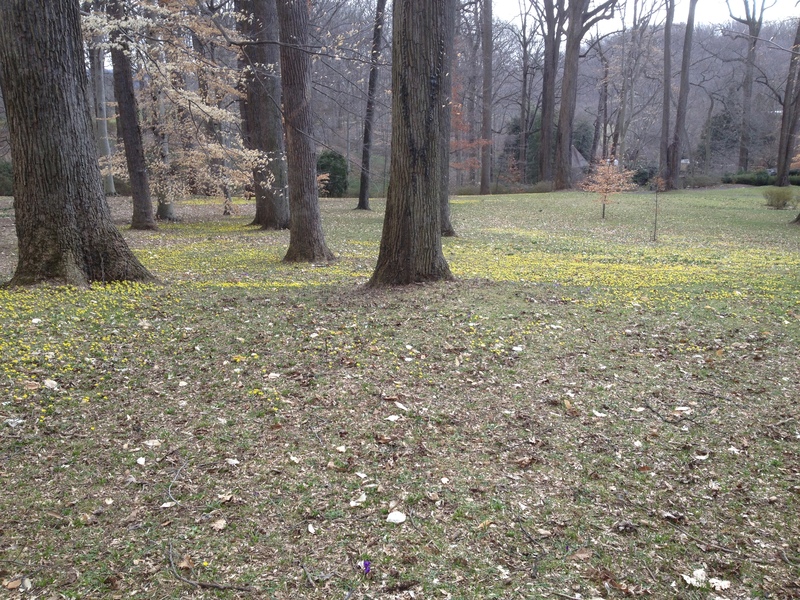 Nothing show stopping and probably started by a stray seed or two that germinated there. This will undoubtedly continue to spread year after year. 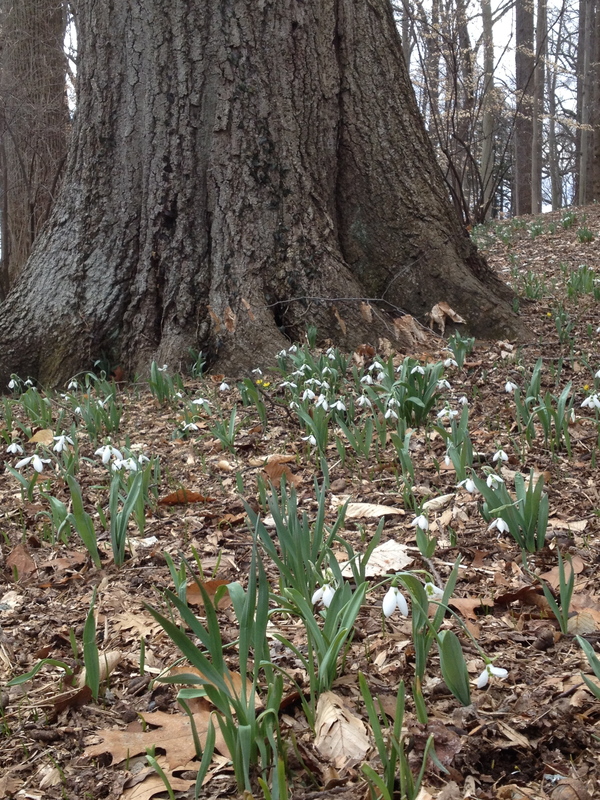 Galanthus at the back of Azalea Woods. The start of a new March Bank? 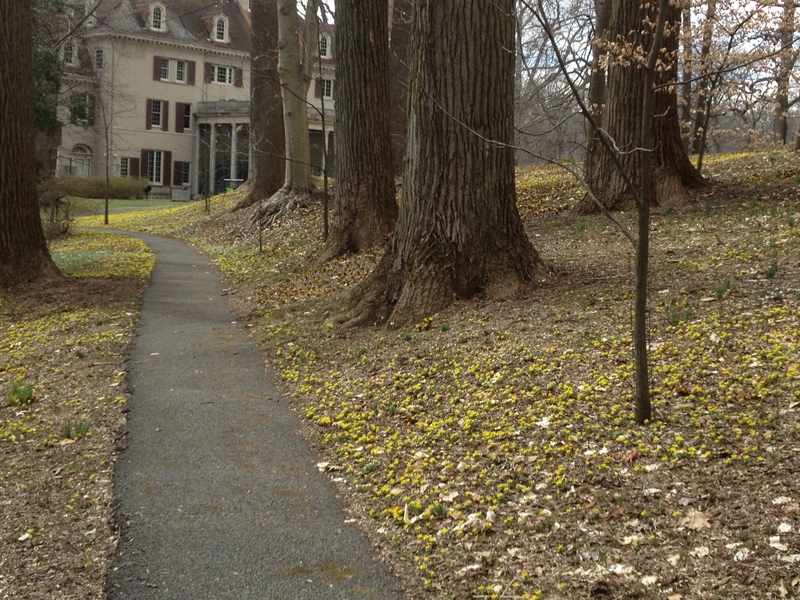 The March Bank is the main draw at this time of year due to its large brush strokes of color, exemplified here by the yellow river of winter aconite flowing down the hill toward the museum. This is a view that has evolved over time; seeds dispersed by gravity and rainfall created this movement of flower that no human could replicate, one of the reasons it looks so “natural”. 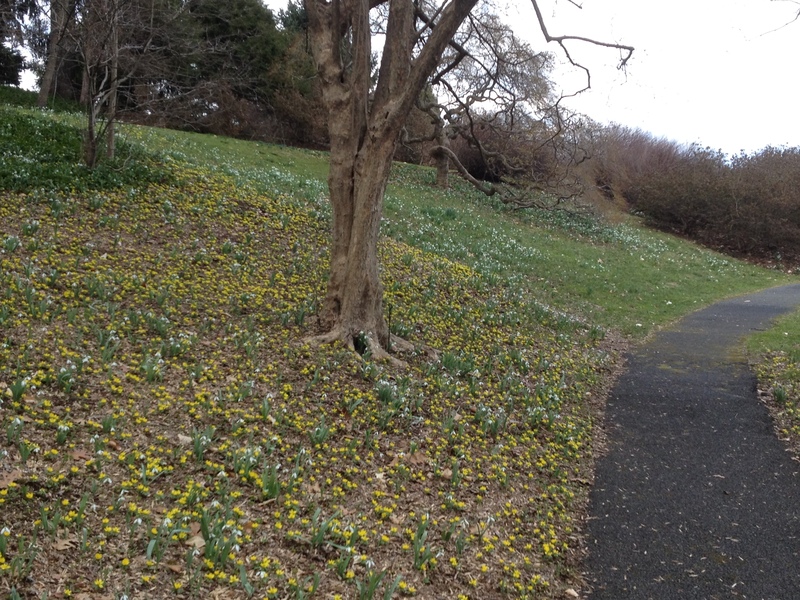 Progressing down Garden Lane toward Magnolia Bend, the flowers have worked their way into the lawn from the March Bank woodland. Passing by the March Bank (don’t worry, the journey will end there) the woodland opens up to meadow. 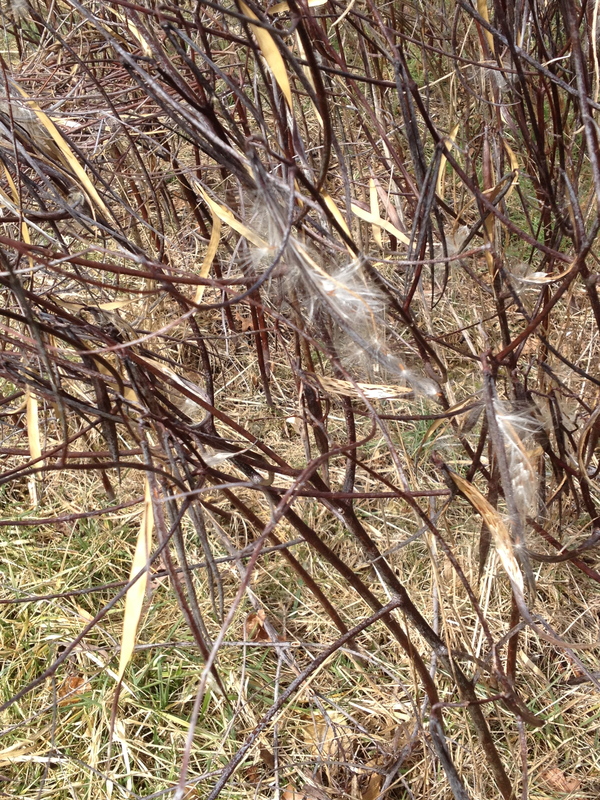 Light and warm breezes set aflight the seeds of dogbane creating a magical “fairy” moment that was not anticipated but always welcome. 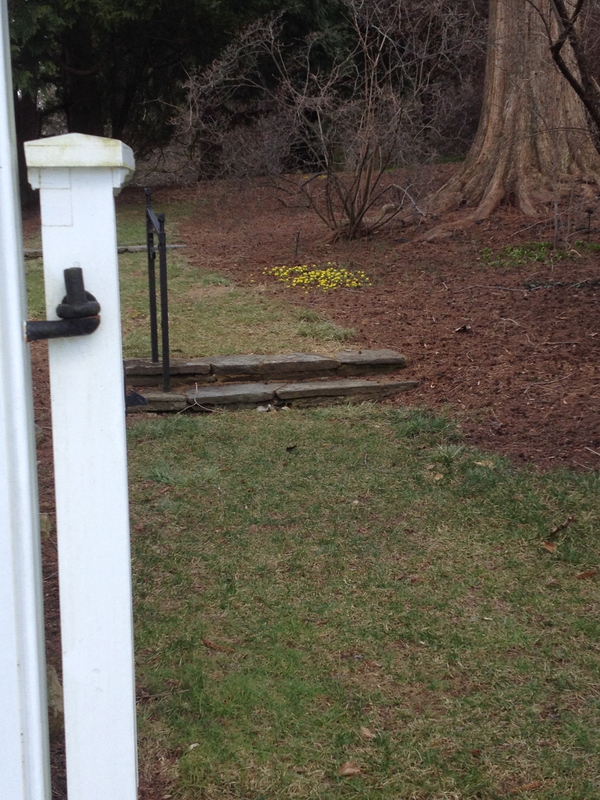 Continuing on, who would have thought to look for a patch of winter aconite beyond the White Gates of the Pinetum? 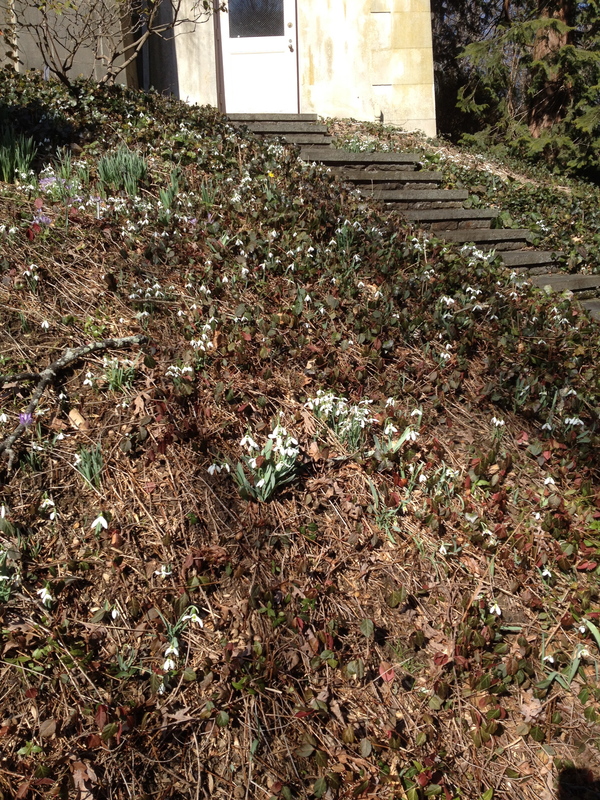 Or snowdrops popping up along Sycamore Hill below the Bristol Summerhouse? 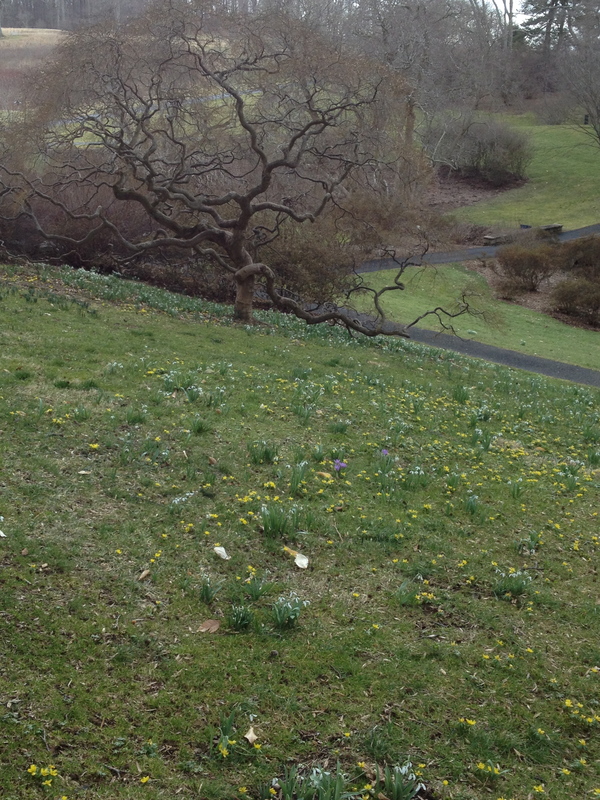 I have often considered the Quarry Garden to be a miniature March Bank, sporting much of the same early flower palette but about as far away from the March Bank as you can get in the garden; another reason to go out and explore. 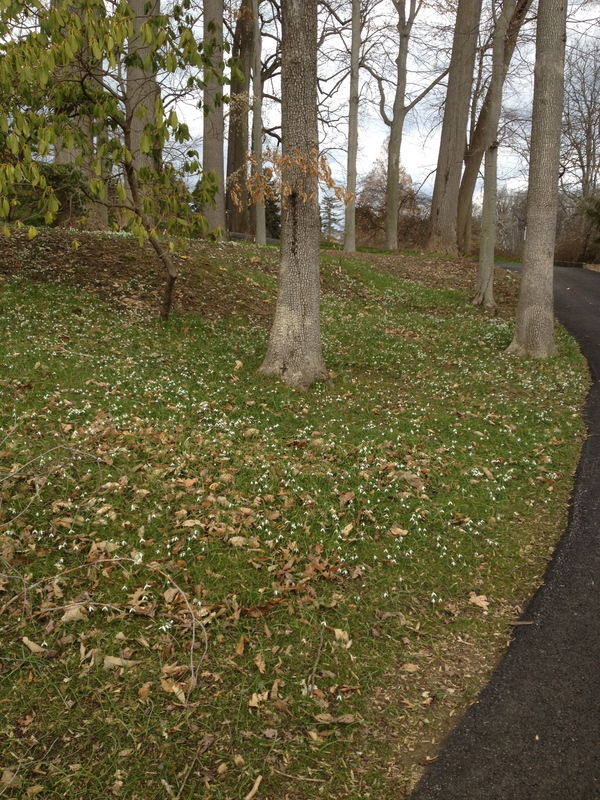 Oak Hill is touted as one of our “fall destinations” but holds its own in spring display as well. 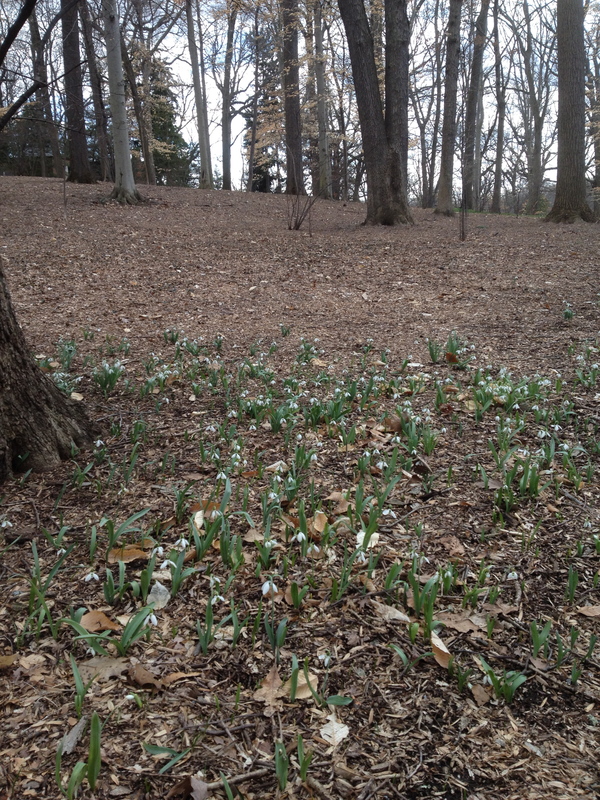 The newly seeded grass area (a woodland-turned-sunny by the loss of three large trees in a summer storm) helps to show off the small white flowers of the common snowdrop. Enchanted Woods’ features hold multi-seasonal interest but the highlight on this tour was the small patch of tommies tucked by the base of a tree. The tight spot indicates the artful hand of Mother Nature. The Reflecting Pool is a much sought after respite in the garden but again, not a place one would necessarily think to see winter bulbs. and culminating with the view from below the Japanese maple at Magnolia Bend. 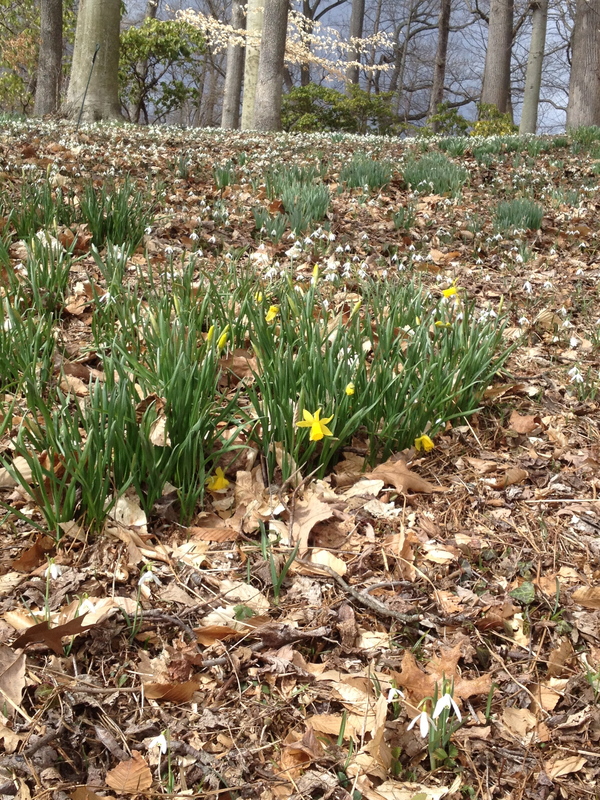 There are many lessons that the March Bank teaches which can serve as design inspiration in your own garden and one of them is that seeds spread! 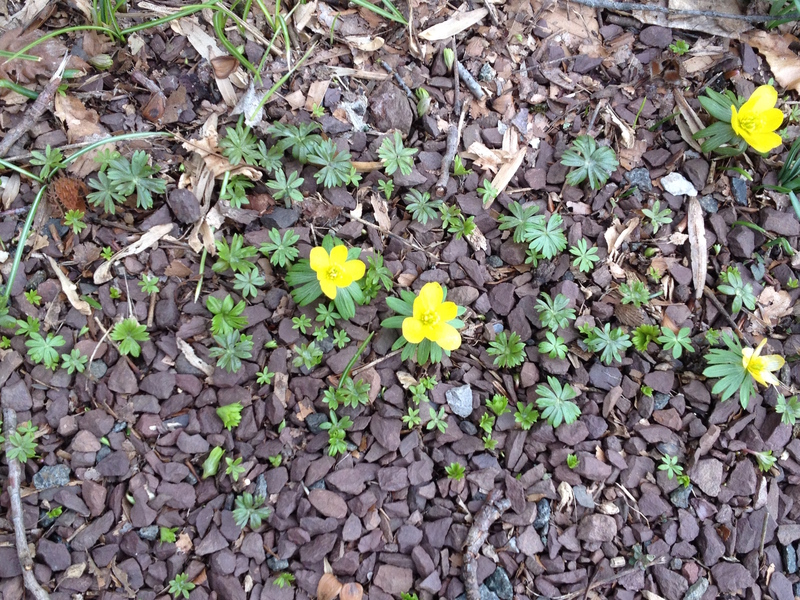 Looking at the ground around winter aconite you will find the “future generations” underneath the parents. It does not take long for displays to happen. 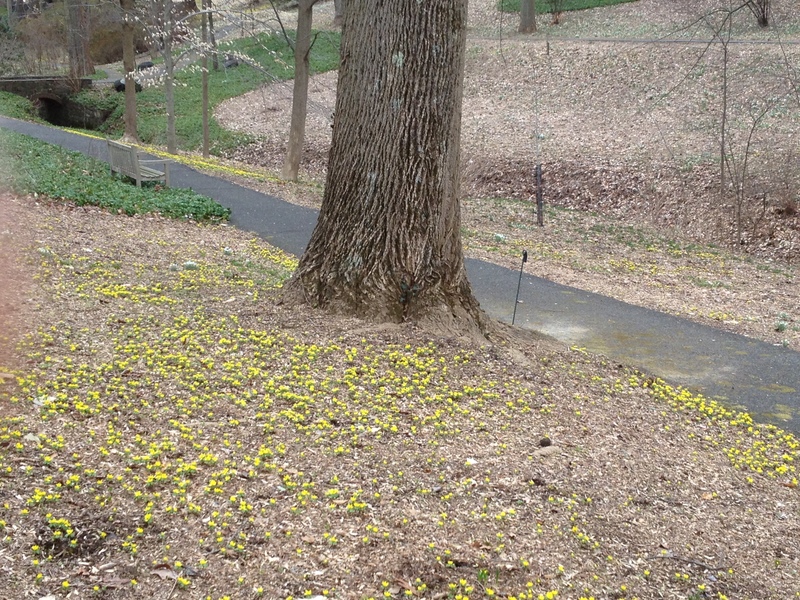 This show of winter aconite was started maybe 15 years ago. 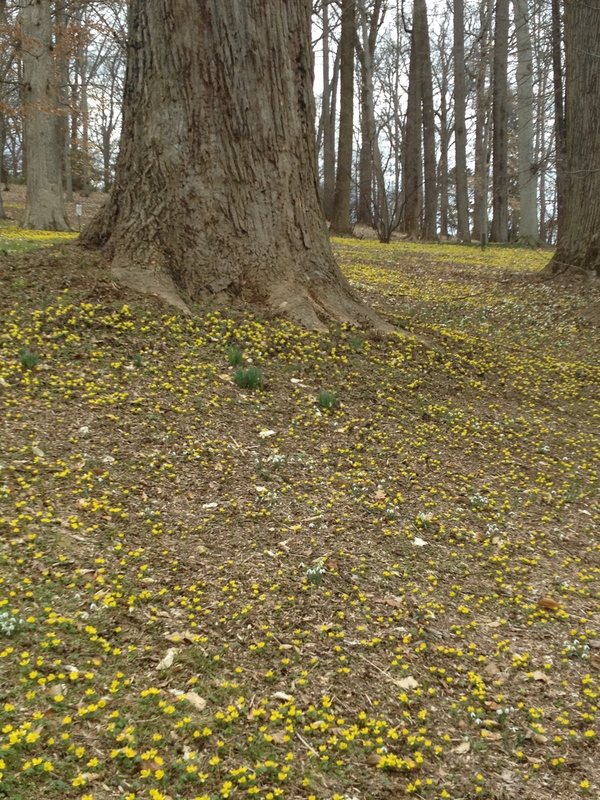 Ripe seed of winter aconite was collected and simply tossed in the beds. Time and nature did the rest. This display will only improve with the years. 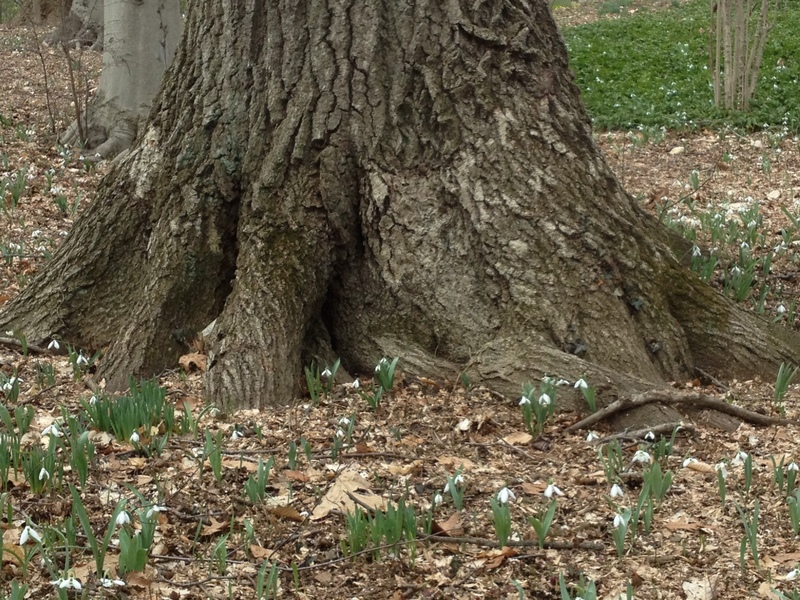 Outside of just their sheer beauty, bulbs can help attune us to things we may otherwise overlook, such as the detail of this tree trunk. 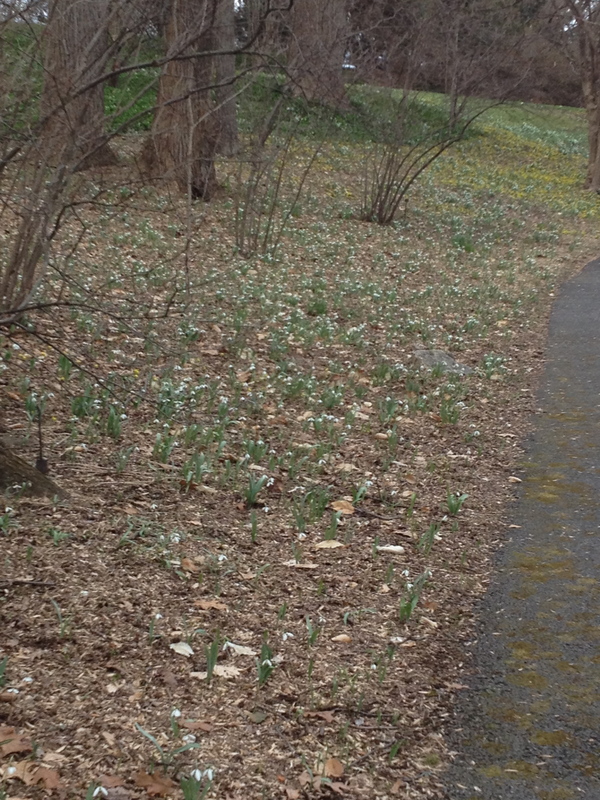 This is a view highlighted by the quiet awakening of a woodland floor; the diminutive, white flowers leads the eye to our surroundings. The flower displays don’t end here. 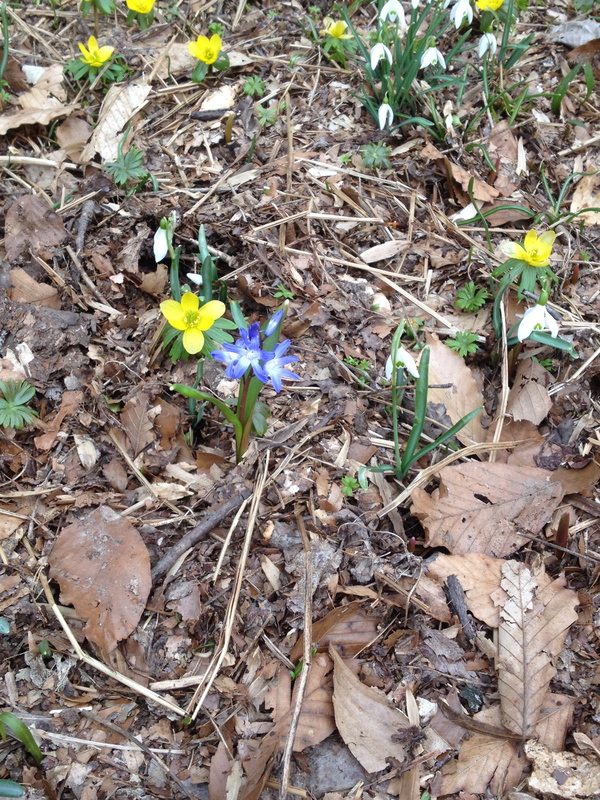 Among the present sweeps of color, we get a glimpse of what is yet to come both on the March Bank, and if planned right, in our own gardens. 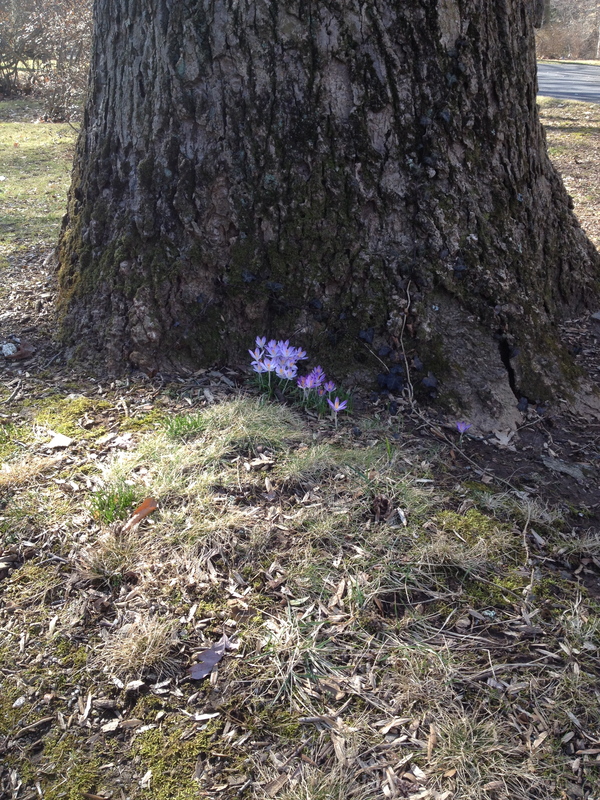 Spring is fast upon us and the unfolding of the garden happens daily; come often and be inspired.